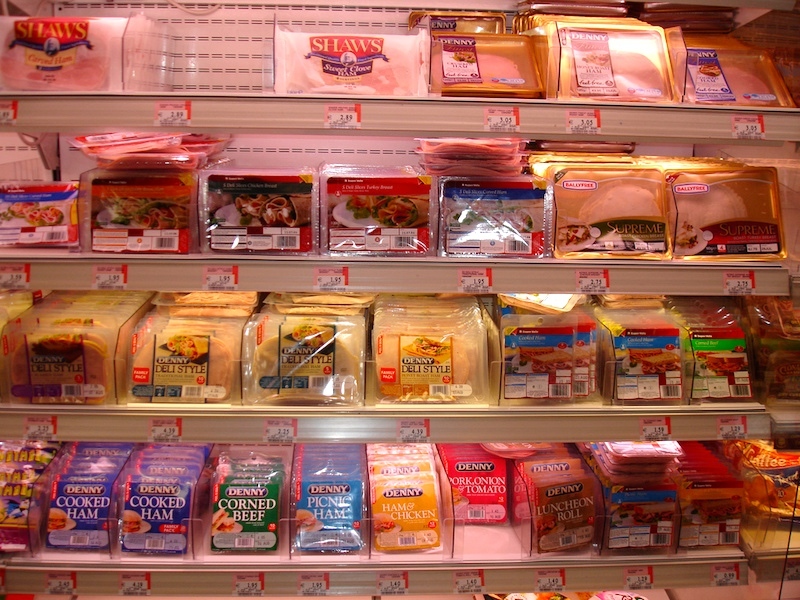 Recently I wondered about the story of cold cuts ‘lunch meat’, an Adj + N composite that is not particularly transparent semantically (in fact, lunch meat isn’t fully transparent either). There’s some interesting linguistic history here. But there’s clearly also some substantial cultural history to be uncovered, and for this I don’t have the resources. Lunch meats — also known as cold cuts, luncheon meats, sandwich meats, cooked meats, sliced meats, cold meats, and deli meats [my preferred term is lunch meat, with the SG M noun meat rather than PL C meats] — are precooked or cured meat, often sausages or meat loaves, that are sliced and served cold or hot on sandwiches or on party trays. They can be bought pre-sliced in vacuum packs at a supermarket or grocery store, or they can be purchased at a delicatessen or deli counter, where they might be sliced to order. Form. 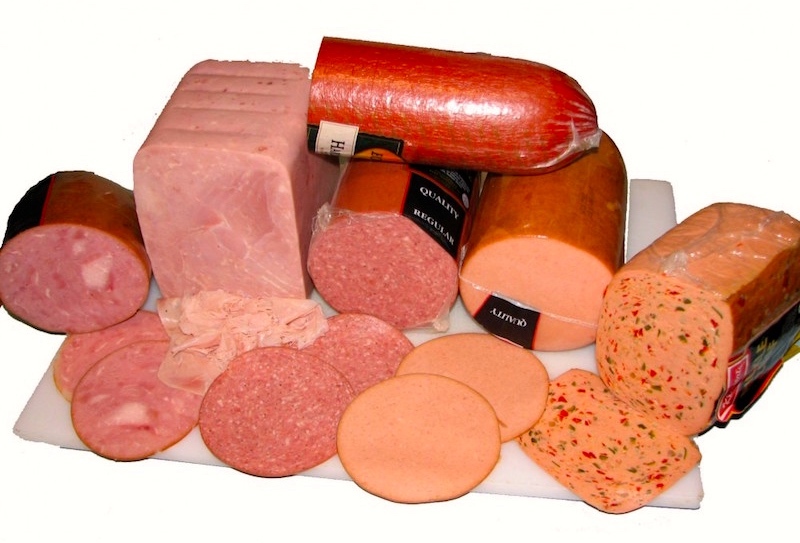 The form of the names is of two types: N + N compounds (sandwich meats, deli meats, luncheon meat(s), lunch meat(s)) and Adj + N composites (cooked meats, sliced meats, cold meats, cold cuts), but all have the “compound accent” pattern, with primary accent on thew first word. So cold cuts is like White House or blackbird — Adj + N in form, but with compound accent and with non-compositional semantics (even though the White House is white, blackbirds are black, and cold cuts are cold). The cultural context. So much for the basic linguistic facts. I am, first of all, surprised at the recency of terms for the food category COLD-SLICED-PRECOOKED-MEAT. Foodstuffs in this category have been around for a very long time in the eating practices of European countries generally. But apparently it’s been only recently that the category itself has become culturally significant, perhaps through the spread of a “sandwich culture”, in which foodstuffs in this category play a central role. Delicatessen is a term meaning “delicacies,” or “fine foods.” In English, “delicatessen” originally meant only specially prepared food. In time, the delicatessen store where this food was sold came to be called a delicatessen, often abbreviated to deli. The modern German version is spelled Delikatessen, which may have helped support the alternative popular etymology that the –essen part of the word derives from the German verb essen (English: to eat), or the noun das Essen (English: the food). In Europe, delicatessen has a different meaning than in the United States, as it designates top-quality (and top-price) foodstuffs, stores and counters. In German-speaking countries a common synonym is Feinkost, meaning fine food, and the shops that sell them are called Feinkostläden (“stores for delicacies”). Department stores often have a Delikatessenabteilung (“delicacies department”). In the United States, a delicatessen store, or deli, is a type of business that could be described as a synthesis of a grocery store and a restaurant. The delicatessen store offers a wider and fresher menu than those found at chain fast food restaurants, rarely employing fry machines (except for chicken), and routinely preparing sandwiches to order. They may also serve hot foods kept on a steam table, like a cafeteria. 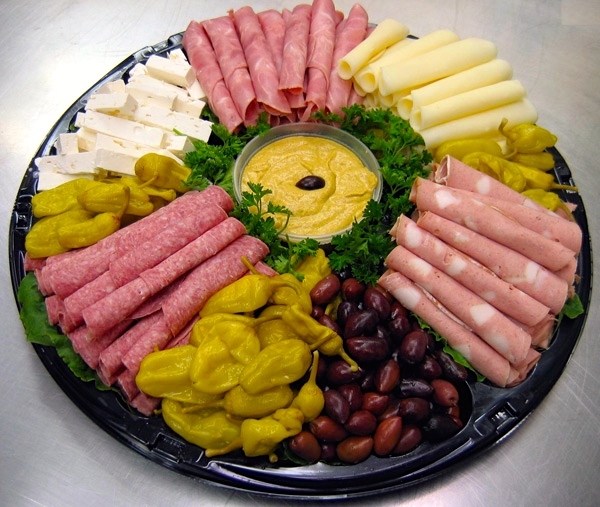 They sell cold cuts by weight and prepare party trays. Delicatessen stores vary greatly in size but are typically not as large as grocery stores. In areas with high rents for retail space, delicatessen stores are often quite small. In addition to made-to-order sandwiches, many U.S. delicatessens offer made-to-order green salads. Equally common is a selection of prepared pasta, potato, chicken, tuna, shrimp, or other variety of “wet” salads, displayed underneath the counter and bought by weight or on a sandwich. Precooked chicken (usually in roasted and fried varieties), shrimp, cheese, or eggplant dishes, (possibly fried or parmigiana style) are found frequently. Delis can be either strictly take-out, a sit-down restaurant, or mixture of both. And frequently an American deli will also offer specifically Jewish food — bagels and lox, of course, and chopped liver and pickled herring, but also gefilte fish, kreplach, and the like. There’s a lot of cultural history to be written here. This entry was posted on November 12, 2015 at 7:56 am and is filed under Compounds, Etymology, Language and culture, Language and food, Lexical semantics. You can follow any responses to this entry through the RSS 2.0 feed. You can leave a response, or trackback from your own site. Side note on compound accents: In my idiolect (born and raised in New York City). sour cream is one such, but I discovered as an adult that in some other parts of the country it is not, but rather the two words get approximately equal accent. As a result, I was an adult before I ever thought about the fact that the foodstuff that I knew as “sour cream” was in fact cream that gone sour (albeit in a controlled fashion).